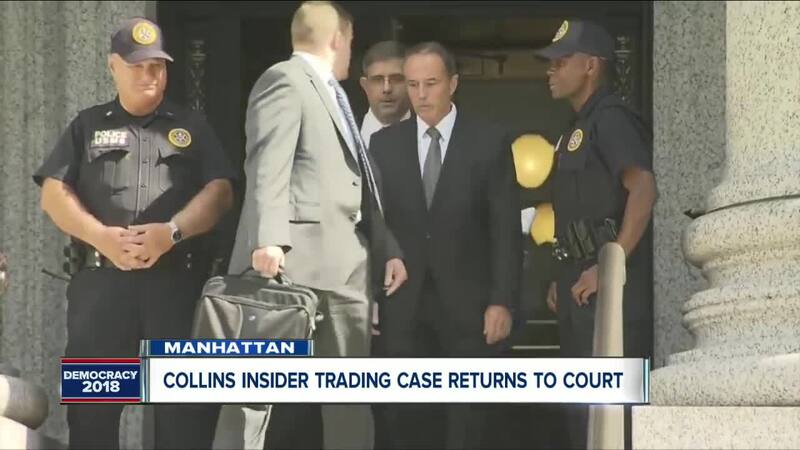 A federal judge has set February 3rd, 2020 as the date Congressman Chris Collins will go on trial to face charges of insider trading. Hon. Vernon Broderick handed down that decision Thursday afternoon during a federal court hearing in Manhattan. The trial date is later than federal prosecutors were hoping for. Scott Hartman, Assistant United States Attorney, argued that it was in the public's interest to have an early-mid 2019 trial. "There is no reason it should take more than a year and a half to resolve this case," Hartman said. Hartman cited the 2020 election as something to be taken into consideration as well. "[The trial date] really shouldn't matter to the government," Jonathan New, attorney representing Collins, said. Collins' attorneys argued they need the time to prepare for the trial, including reviewing the interviews the government conducted with his staff to determine of the details given are privileged. Seven attorneys were present to speak on behalf of Collins, his son Cameron, and Stephen Zarsky, the father of Cameron's fiancee. None of the three defendants were present, which was agreed upon ahead of the hearing. A letter previously submitted to the court by Collins' attorney states "Rep. Collins will be in-District in the Buffalo area on the date of the status conference, as October is a District Work Month for Congress." Collins' attorney said this was not a hearing and there are "no presently-pending motions." Chris Collins, Cameron Collins, and Stephen Zarsky are all charged with insider trading. Each has each pleaded not guilty. An August complaint, filed in the United States District Court, Southern District of New York by the U.S. Securities and Exchange Commission accuses Cameron Collins of selling large amounts of stock in Innate Immunotherapeutics, Ltd. before relevant information about a clinical trial was made public. Chris Collins is accused of giving his son the information. The complaint indicates on June 22, 2017, Chris Collins, a member of Innate's board of directors, received an email from the company's CEO. The email was sent to all board members. It detailed "extremely bad news" about a clinical trial for a drug called MIS416, a multiple sclerosis drug. Fifteen seconds after receiving the email, the complaint says Collins called his son Cameron. They spoke for six minutes. In the next two trading days, Friday, 6/23 and Monday, 6/26, Cameron Collins sold nearly 1.4 million shares of Innate. Stephen Zarsky is accused of delivering the information to his brother and his friend before the information was made public. According to the court filing, Cameron Collins, Stephen Zarsky, and the above family and friends placed orders to sell Innate stock before the trial results were made public on the evening of June 26, 2017. Following his indictment, Collins said he would not seek re-election for the 27th Congressional District seat. He later stunned the Erie County Republican party and changed his mind, saying it was in his best interest legally to remain in the race. Collins is facing Democrat Nate McMurray, the current supervisor of Grand Island.